The Castle School of English | Edit Blog If you study English in Brighton, make sure you visit The Royal Pavilion. The Pavilion building is in the centre of Brighton and very near the beach. It was originally a farmhouse that the Prince Regent stayed at. By 1820, after various alterations, he eventually converted it into the Pavilion we can see today. He had the help of the famous architect John Nash. The interior of the building has a Chinese Islamic and Indian theme. Items were transported from various countries to England. The Prince Regent held many banquets for the rich and famous in his Pavilion. Because of this, the building became associated with indulgence and excess. 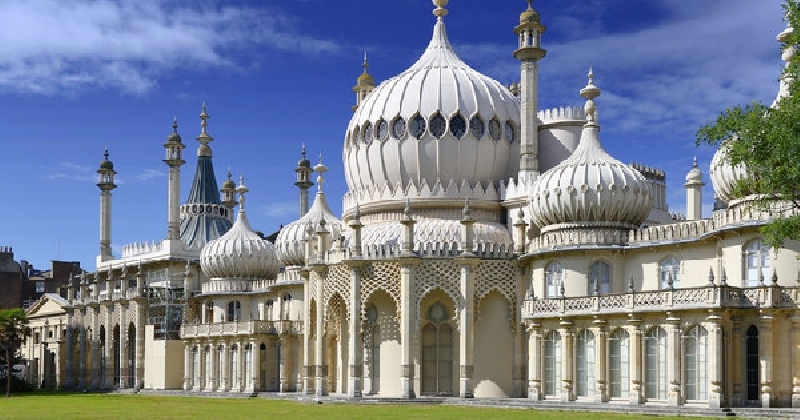 The public of Brighton and the people of England started to call the Pavilion “George’s Pleasure Palace”. Eventually, the people of England started to hear about The Prince Regent’s lavish lifestyle. The stories created anti-royal feelings around the nation. Brighton now owns the Pavilion and it is is open to the public. Over a million people visit it every year from all over the world because they are fascinated by the architecture, the decorations of the interior and the history surrounding the building and the Prince Regent. When you study English in Brighton, at a language school, spend some time exploring this beautiful and exciting city. Meet people, practise speaking English and improve your listening and speaking skills! You should make sure you visit the fantastic Royal Pavilion!